It was NOT my idea. I am just a cigar smoker. Plain and simple. 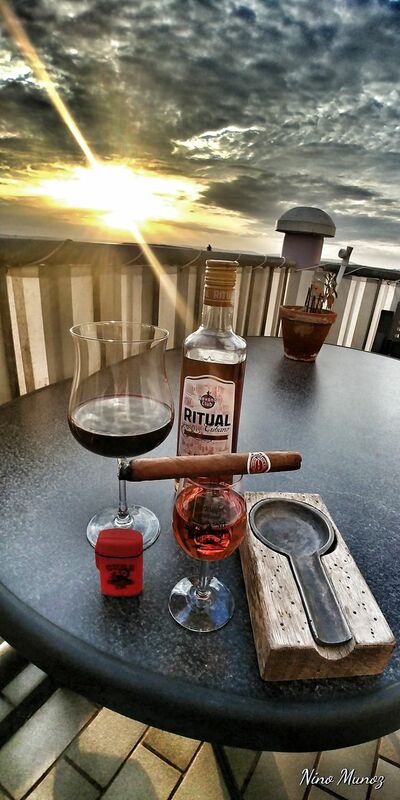 If people ask me for cigar details I will reply : What do I know about cigars …. But smoking a good cigar in Havana with a great friend and excellent master roller on his roof-top terrace under a Mango tree last year, he asked me : Nino, why don’t you create your own cigar ? This left me surprised, laughing and saying : What do I know …. But the seed was planted and after a few days of thinking I came up with what I consider the ideal cigar for my palate. I love the Monsdale flavour and aromas as well as the Puntilla vitola size – so why not combine the two, add a pigtail and a cut foot and have my own cigar creation ? After some trials and testing the cigar is ready and smokes like a dream. Absolutely fantastic for my taste – and that is what matters. One of the Rum brands I have come to enjoy a lot besides Santiago, Mulata and Cubay happens to be Ritual Rum.